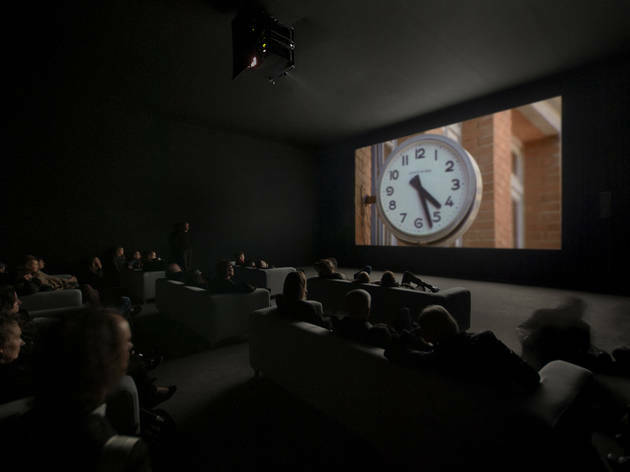 Masterpiece isn't a word to be casually tossed around, but it's hard not to ascribe it to Marclay's 24-hour video, in which movie-land snippets of clocks and watches chronologically depict the minutes of an entire day. A musician turned artist, Marclay has long been fascinated with time, but with The Clock, he transforms literalness into metaphorical transport, examining our fascination with cinema—which Jean-Luc Godard called truth at 24 frames a second—and its entwining with our lives. 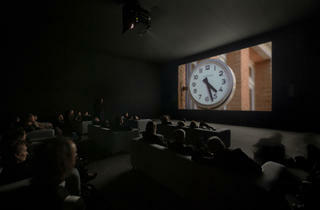 With The Clock, Marclay bends time to his will, mashing together thousands of short film clips to form a seamless, 24-hour big-screen collage charting the passage of each minute of the day. Adding to the artificially temporal climate is The Clock's synchronization with whatever time zone in which it's being screened (if it's 5:11pm where you're watching, it's the same time onscreen). Each moment of the film references a corresponding one on the dial, whether it's a shot of a clock in the background, an unwelcome alarm going off or a memorable scene like the one in Falling Down, when Michael Douglas goes postal at a burger joint at 11:34am because they stopped serving breakfast at 11:30am. It's a fairly mesmerizing commentary on the illusory nature of time and the ways in which we perceive and experience it. One could easily sit there for hours watching soldered clips of dour cowboys heading for the showdown (if you walk in a little before noon, naturally), or David Niven pedantically lecturing Passepartout about the importance of punctuality and planning in Around the World in Eighty Days. Time is the only unifying narrative factor here, and it is more than enough, as Marclay makes the elusive dimension dance with clever arrangement and tempo.